It is the low cost of iron ore extracted from their adivasi homeland mines that enables steelmakers like Tata Steel and Essar, and miners like NMDC, not only to be among the most profitable companies in India, but also gives it the financial muscle to make huge overseas acquisitions. Ultimately, it is the poor adivasi who pays for it with his home and hearth and gets no credit for it! Either from the State, which connives in their exploitation, or the industry that lords over their resources, says Mohan Guruswamy. The exploitation of the adivasi (tribal) homelands for their mineral riches, always to the detriment of the adivasis, has stoked the biggest and most widespread insurgency t0his country has known. The adivasi revolts predate the advent of the Naxalites by more than a couple of centuries. In just the Rampa region of East Godavari district in Andhra Pradesh, more than a dozen tribal revolts occurred between 1770 and 1924. In the early years of colonisation, no other community in India offered such heroic resistance to British rule or faced such tragic consequences, as did the numerous adivasi communities of what is now Jharkhand, Chhattisgarh, Orissa and Bengal. In 1772, the Paharia revolt broke out which was followed by a five-year uprising led by Tilka Manjhi who was hanged in Bhagalpur in 1785. The Tamar and Munda revolts followed. In the next two decades, revolts took place in Singhbhum, Gumla, Birbhum, Bankura, Manbhoom and Palamau, followed by the great Kol Risings of 1832 and the Khewar and Bhumij revolts (1832-34). In 1855, the Santhals waged war against the permanent settlement of Lord Cornwallis, and a year later, numerous adivasi leaders played key roles in the 1857 war of independence. Since the mid 1970s a fire of discontent has been raging in the adivasi homelands in Maharashtra, Madhya Pradesh, Telangana, Andhra Pradesh, Chhattisgarh, Orissa and Jharkhand. Much of this anger relates to how the big mining interests have ravaged the adivasi homelands, and how the people have been forced out of their lands. Worse, little of the royalty extracted by the State trickles down to the people whose homelands are being destroyed. For decades the royalty on iron ore was a meager Rs 27 per tonne. After the troubles in the adivasi homelands intensified, the Government of India woke up to the realisation that the exploitation cannot go on as before and in 2009 it increased the royalty to 10 per cent of the sales price. It is now proposed to raise this to 15 per cent. Because of this there is now a huge orchestrated campaign against this and the PR machinery of the big ore and metals companies are working overtime to have this rolled back. We know from experience that governments are always susceptible to the blandishments of the well heeled. But who is there to speak for the major stakeholders in the game – the adivasis? That the increase in royalty on iron ore from 10 per cent to 15 per cent would lift the cost for miners by Rs 150 to Rs 250 per tonne ($2.50-$4.00) is plausible. Dhruv Goel, managing partner at industry consultancy SteelMint, says: "But they will not be able it pass it on completely to steelmakers for the reason that imports will be cheaper and people will prefer imports over domestic ore." This is just nonsense. In 2009, when it was raised to 10 per cent of the market price, in reality this was raised to Rs 270 per tonne, when it should have been twice that or more. The cost of extraction is estimated to be not more than Rs 350 per tonne. The export price has never fallen below Rs 5,000 per tonne. In February 2010 the landed price per tonne of Indian iron ore in China was $128, which was then over Rs 6000 per tonne. At present the purchase prices are around $100, which is still Rs 6,000 per tonne. Thus, iron ore margins accruing to the miners and steel companies remain consistent and huge. The economics of steel manufacturing has been made explicit by the BusinessWorld of July 31, 2010, in its story on the financial dire straits of Ispat Industries. This insightful article details how the Mittal owned Ispat could never earn profits unless it has its own “captive” mines like Tata Steel, SAIL and others. And in doing so lets the cat out of the bag. The case is simple. Ispat spends about half its revenue on iron ore. Tata Steel, SAIL and others like Jindal, Essar spend about 20 per cent. With captive mines Ispat’s input cost of iron ore will be 70-80 per cent cheaper. At present Ispat uses seven million tonnes of iron ore annually, of which the public sector NMDC supplies five million tonnes. The average price of this iron ore is about Rs 6,000 per tonne, while if derived from “captive” mines it would cost merely about Rs 500-550 per tonne. Quite clearly the margins on iron ore are huge and the miners, steelmakers or merchants, are raking in huge profits. The implications of this price difference should be obvious. What perhaps is not so obvious to most is that this is essentially a profit extracted from the nation’s mineral reserves, which mostly lies in the adivasi homelands and if one is to go by the Constitution, the rights and royalty rates are theirs to give and fix. The irony is that it is this low cost of iron ore extracted from their adivasi homeland mines that enables steelmakers like Tata Steel and Essar, and miners like NMDC, not only to be among the most profitable companies in India, but also gives it the financial muscle to make huge overseas acquisitions. Ultimately, it is the poor adivasi who pays for it with his home and hearth and gets no credit for it! Either, from the State, which connives in their exploitation, or the industry that lords over their resources. 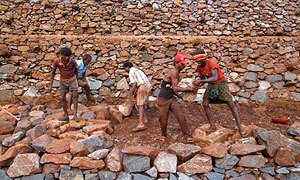 How have the adivasis benefited by this “industrialisation”? We have before us the experience of the public sector Navratna, National Mineral Development Corporation’s giant iron ore extraction project at Bailladilla in Bastar’s Dantewara district. The locals have got nothing but the most menial jobs and in return their hitherto pristine environment is ravaged beyond recognition with the streams choked with the debris of excavation. The Supreme Court, while dealing with a case relating to the acquisition of tribal land in Sundergarh district of Orissa by the Mahanadi Coalfields Ltd, a Government of India enterprise, found that people whose lands were taken two decades ago were still not paid any compensation. In a stunning rebuke to the government, a bench of the court comprising Justices Aftab Alam and B S Mohanty termed its development policies “blinkered” and held it responsible for “fuelling extreme discontent and giving rise to Naxalism and militancy". 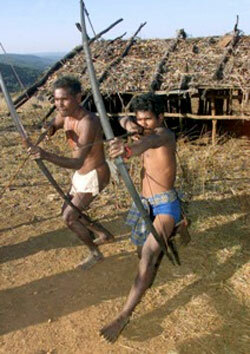 Top image: Tribals demonstrate with bow and arrow. Image: Reuters. Should Tata be ranked India's best brand?